Win a necklace from my Vintage Lace Collection! You and Your Wedding magazine are running a competition to win jewellery and tickets to the Great Northern Contemporary Craft Fair in Manchester this weekend, 21st 23rd October. 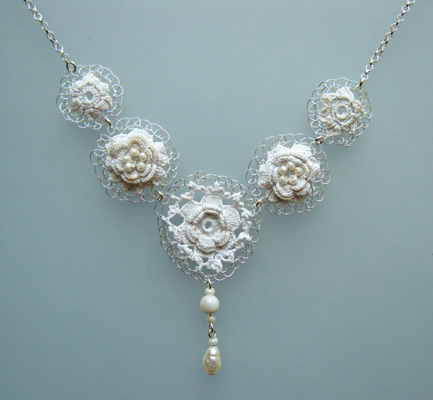 Win this Fiorenza necklace handmade with vintage Irish crochet lace and silver. I will be exhibiting at The Great Northern Contemporary Craft Fair, stand 59. Most woman First preferable is necklaces and same time also have stones inside the necklaces it more attractive. Nige blog!!. <a href="https://www.lalithaajewellery.com/jewellery/collections/antique%20collections/MzNaWF9HVEpNX1FXRQ"> Antique Jewellery Collections</a>.